This is a quick project you can make and finish yourself in an afternoon. It’s a perfect introduction to Bargello and needlepoint for anyone, even kids. The pattern and colors are inspired by a pillow from the Italian designer Missoni. They are famous for their multi-colored knits and for patterns that often remind me of Bargello. This design uses three sets of two colors to make a dramatic, but small-scale zig-zag design, perfect for this small project. 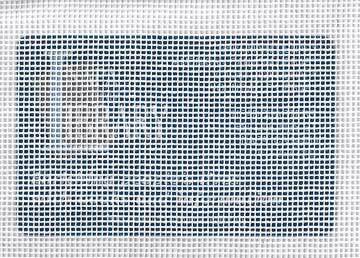 Although the instructions are for 18 mesh canvas, any mesh size can be used, only the scale of the pattern will change. Note 1: The wallet should have a solid clear holder for and ID on the outside (not one with a hole) for the needlepoint. The model uses one from Paul & Taylor. The second clear pocket on the inside is where you will put your ID. Sometimes these are sold as “memory wallets.” Many companies make them. If you have a choice, pick one which has an opening at the long edge; it’s easier to finish. 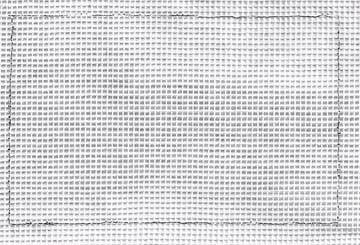 Note 2: Interlock is preferable than mono canvas both because it is thinner and because it can be cut one thread outside the stitched area. The wallet doesn’t have much space for edges, so this is a real asset. Using either the credit card cardboards that come with the wallet or a card of your own, place it below the canvas, lining up two adjacent sides with threads of the canvas. With the permanent markers, mark the center point of the threads nearest the card edge on each side. Join these marks to make a rectangle. 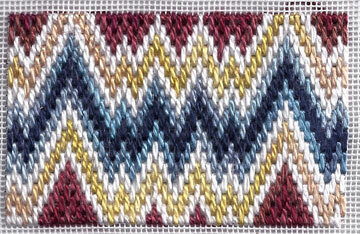 Beginning with the red stitch in the bottom center of the drawn rectangle, stitch the Bargello pattern using a single strand of the yellow thread. Stitch from the center to one side. Thread another strand of Watercolours so you will begin stitching with the same color as the first stitch and stitch from the center stitch to the other side. This establishes the pattern for the wallet insert and every row will follow this pattern. 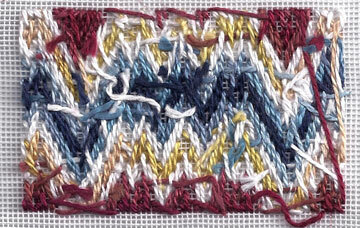 Bargello is simple to stitch; it is a straight stitch going over several threads. In this case, all stitches go over four threads. 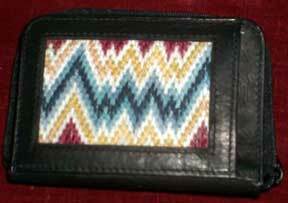 The stepped look of Bargello comes from the movement of stitches up or down in a pattern. This movement is called, sensibly enough, a “step.” In this pattern the steps are all two threads high. Although you don’t have to make Bargello in any particular way, I find the stitches look better if you have more coverage on the back. To do this, you make the stitch from top to bottom if the row is moving up, and from bottom to top if the row is moving down. Where the direction changes, you will still have less coverage on back, but it will be minimal. The white group is repeated between each color group. Stitch the white rows above and below the yellow row. Below this color group, stitch the red-brown group. Above this color group, stitch the blue group. Continue with the pattern in the color sequence until the area is completely stitched. Stitch over the lines you have drawn. Trim the canvas so only one unstitched thread is left on three sides. Trim the margin to about 4-5 threads on the remaining side. The side with the larger margin should match the side of the opening on the wallet. This side with the larger margin is at the outer edge. Push the trimmed Bargello into the opening until the design fills the window completely. You may have to push from both sides, but it does go in. Fold under the showing margin and you are ready to show off your needlework!